This blog post tells you how to upgrade a Samsung Galaxy Mini GT-S5570 android phone. More specifically it tells you how to replace the stock ROM on the Galaxy Mini for a newer custom ROM. Warning: This guide is for those running Gingerbread or higher on their GT-S5570 phones. 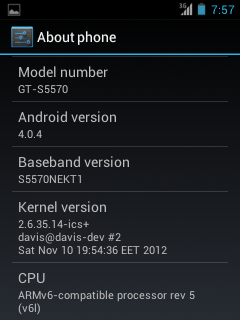 If you are using Froyo please read our how to upgrade Froyo to Gingerbread on a GT-S5570 guide. Update 19th September 2013: If you are looking for custom roms for the Samsung Galaxy GT-S5570 please click the link for my suggestions. Warning: You might find your phone not working! You follow these instructions at your own risk. I should also stress that I’m a novice at this, and when in doubt either avoid doing the upgrade or go seek expert help elsewhere! WARNING: YOU WILL VOID YOUR WARRANTY FOLLOWING THESE INSTRUCTIONS! WARNING: YOU COULD ‘BRICK’ YOUR PHONE FOLLOWING THESE INSTRUCTIONS! When I mention ‘brick’, I mean you literally could stop your phone from working. At the time of writing the Galaxy Mini is an outdated, often forgotten about phone. However it is still being sold brand new around the world. The camera is awful, but for the price it is a very capable phone. Upon purchase of the phone I had updated it using the Samsung Kies software to the latest version Samsung provided. However owning another device running Android 4.x.x I wanted a similar feel and experience on my GT-S5570 which was running the 2.x.x branch. I knew there would be limitations, especially in terms of battery and performance, but decided to make the upgrade and this guide details how I did that. I won’t be installing high performance apps, but the rom I used to update my phone looks good and handles okay. I am incredibly grateful to the Android community for making this whole process possible. It has enabled me to get more ‘bang for my buck’ (I’m British by the way!). A microSD card and reader (optional, but could resolve problems). A replacement Galaxy Mini GT-S5570 rom. To upgrade the Galaxy Mini from a 2.x.x Android phone to a 4.0.4 Android phone! 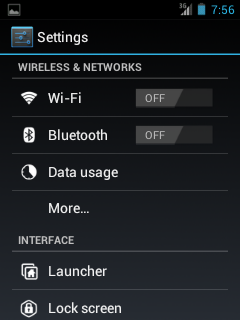 A secondary objective is to get rid of the Sumsang ‘bloatware’ and to have more familiar Android feel to the phone. You might find that your battery doesn’t last as long after the upgrade. I’m not sure if this is the case, as I’ve personally only been running the new ROM for a short period of time, and mainly use my phone for calls, messaging and Skype. I’ve written this guide as I found the whole process slightly troublesome being a novice. This guide serves two purposes: Firstly to act as a guide to myself in the future, should I require it! Secondly to help others. Note: After a failed attempt at upgrading my ROM, I could no longer access my microSD card via USB cable. Therefore to move files to my microSD card, I took the microSD card out of my phone and used a cheap card reader to transfer files to the microSD card. Warning: If you don’t have a way to move files to your microSD card without using a phone’s OS, you should probably not continue! You need to know: At various stages you will need to know how to boot into recovery mode. You do this by holding the power button and the home (large bottom middle) button at the same time until the boot loader appears at start up. Warning: Make sure you have fully charged your battery up before following the instructions! Step 1 – Root your phone. Warning: Note by proceeding you void your warranty and could kill your phone. If only I had done this first it would of saved me a few headaches and much time! Don’t just think of the package as backup and recovery, but also the package that can help you install your latest ROM! Visit http://forum.xda-developers.com/showthread.php?t=1864987 and follow the instructions to install CWM for Galaxy port. I recommend you then perform a backup using the CWM package. You don’t need to uncompress (unzip) the archive, but instead move the zip file to the micoSD card. Then perform steps one and two again. Note: Your phone will take quite a while to boot up the first time! Don’t worry it will not take this long next time. You know the ROM has loaded when a graphic of a person in blue appears. Okay as I didn’t original follow the steps above straight away, I ran into various problems (lucky me), which I cover below. Turns out I had formatted my microSD card using the wrong file system type. Simply solution (in Microsoft Windows) is to right-click on the microSD partition and select ‘Format’ and then restore the file system type (or similar message appears). I had formatted to exFAT, but my 2GB needed to be FAT. Upon trying with numerous ROM zip files, it turned out I just needed to install a version of CWM for my specific mobile phone to resolve the problem. Once ClockWorkMod was installeld I didn’t see this message again. The Samsung Kies software failed to connect to the phone. i.e. connection failed. By upgrading the phone, you lose the ability to use Kies and it won’t connect. I ran into this problem during a failed rom upgrade, and just used the microSD card reader option to transfer files. Also some official roms (perhaps older) fail to work with the Samsung Kies software. A third method for upgrading the GT-S5570 I know of, but never tried is via the ODIN software (probably voids warranty). 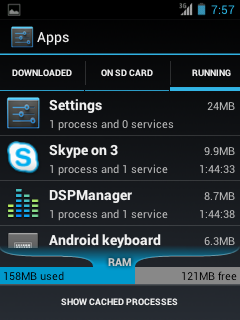 This also can be used to transfer roms and it is possible to find rom images for many service providers. Next I wanted to install Google Play, but it does come as part of CyanogenMod, so I needed to install it manually. I visited http://goo.im/gapps and download the version for my phone. 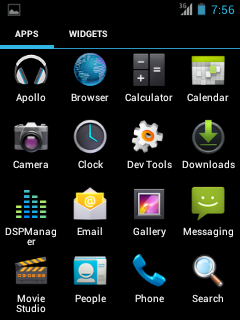 For me personally I used the http://goo.im/gapps/gapps-ics-20120429-signed.zip , as I had installed the CyanogenMod 9 ROM which is running Android 4.0.4 Ice Cream Sandwich (ICS). Then I transferred the zip file to the sdcard, rebooted into recovery mode and selected ‘install zip from sdcard’ using the ClockWorkMod (CWM) package. The install process took around ten seconds and then afterwards I rebooted. 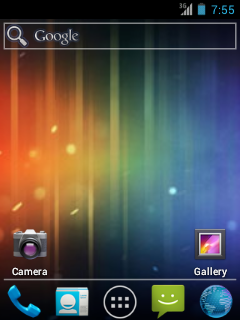 Upon reboot the message appeared ‘Android is upgrading’ and it optimised applications for my phone. That process probably took another thirty seconds. Then I clicked on the Google Play icon and signed in with my Google account. Afterwards I turned sync off, to help me save battery life and I will turn on from time to time. I’ve been using this new rom for less than twenty-four hours, and other than missing Samsungs gesture (sweeping) typing functionality, it is quite good. 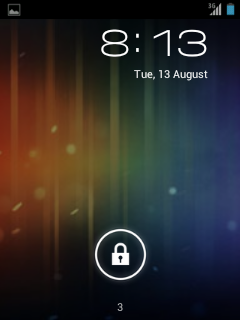 Whether I decide to stick with this rom will hugely depend on whether I can put up with the battery life. Though I’m being sensible and only leaving wifi or Skype on, depending on whether I truly require it on. I probably will purchase the Swype keyboard software, as the trial seems to be working well. I will make that decision in a week or so, depending on whether I stick with the rom. I edited your comment, as I don’t allow swearing on my blog. You will find the details about using ODIN halfway down that blog post. Hope you are able to resolve the problem. Sorry to read about your phone problem. How do I install CWM on this? See the link in the comment above yours, which is a blog post I wrote about how to use ODIN to flash the rom. I kind of broke my phone and after i followed this tutorial, the phone got stuck on the SAMSUNG screen for over an hour and then I turned it off. Do you know how to fix that? Sounds like you need to wipe the cache partition again. You might also want to read my Froyo to Gingerbread guide for the GT-S5570 which shows the ODIN method of upgrading the phone.